Concept behind : It is about too much love for someone. For me, love is like a coffee. Its aroma is so charming but too much coffee put together will give out very bad odor. Too much love also results in bad situation. When espresso comes out of the machine, its crema makes it valuable, but if too much espresso comes out, like too much love, it will not lead to any good thing. Precious espresso turns out to be waste. Weight of too much love will destroy the relationship like too much coffee that breaks the glass. I am a dancer who just tried to make a dance film. I have no knowledge about film making. I just used the feeling how it should be like and then searched on the internet for some technical things. This video was filmed in the squash court at my condo. I borrowed my father’s video camera and tried putting the video camera and my Canon camera in various spots to see how the image look like and asked my sister and my brother-in-law to help me record. I borrowed my sister’s small coffee machine and use my barista knowledge (I was a barista for more than a year) to make a coffee. I recorded when I pour milk and sugar into the coffee by iPhone 4. I adapted many blue yoga mats (I teach yoga so I’ve got a lot of yoga mats) to make a (simple) blue screen. And I used my mother’s mac pc for making all the stuff. So thanks to my family for helping. And thanks to ‘someone’ for being the source of inspiration. Too much love I had for you had already killed our good friendship …the precious one… So goodbye my best friend. It’s sad but .. If one day people ask how important you are to me, I’ll tell them, you are just a stain of coffee on my worn-out shirt. ..
After we had studied a lot of trees and gained enough confidence in drawing lines, creative flowed naturally. Then it was time to make art, applying those lines into creative work. In this term each artist had 2 master pieces. First piece was a deconstructed version of tree. We played with dots and continuation of lines, starting from small dots which represented seeds at the bottom of paper and bigger dots scattering on the upper part of the work representing fruits of this imagined tree. Then our young artists need to connect those dots – from seeds to fruits – with lines. Many lines from many seeds travelled up to form a patch of dense lines which turned to be a trunk. Those lines travelled apart from each other again to form many branches of the tree. They were intertwining, weaving, and criss-crossing with each other. They travelled up to the top part of paper to encircles the bigger dots which were fruits of the trees. Eventually, a clear image of imagined tree was revealed. The second work, we invited kids to see what was inside the trunk. They were inspired by beautiful pictures of those year rings. A very curved line formed a circle, and bigger circle encircling the smaller one inside and so one. The most challenging part was that each line was parallel with the one next to it. This is about focus and control. The rings kept expanding until space on the rectangular drawing block was not enough and some parts of the out rings could not be seen as they could not fit in the paper. This concept was a huge thing for kids to learn. They learned that things which could not be seen did not mean they were disappeared. In addition, for older kids in the class, they learned about space as they needed to be a able to see the lines continuing even though they disappeared from the paper. In a way, they started to learn the concept of ‘cropping’. What’s more, for both younger and older kids, they saw that the shape of the rings, even though they tried to keep them parallel to the inside ring, transformed. Lines, when being conditioned with change of size or space, had their own journey and momentum. Nothing should be perfect in a world of creative art. Things evolve, develop, and change. Artists are not the ones who can control everything, but the ones who accept whatever happen and continue creating from them. And from the photos they saw, some also saw smaller lines between the rings going perpendicular with the ring itself. Then they started to draw small lines between the rings and we agreed to develop on that idea. As a result, they had options to draw small lines between the rings or color in that space instead. The most beautiful part of this work was reserved for small dots which were to be added between tow rings the last. The idea was from a part of trees called xylem. It is a type of transport tissue in plants. The young artists apply white glue on paper in the space between the chosen two rings, then sprinkle cut out dots (prepared by teachers using a hold punchers) on the rule. With the glimpse of spontaneity and confidence plus combination of colors carefully picked by themselves, the artwork came out very stunning. It was such a beautiful work made out of simple things – just dots and lines. It was such an enriching term. The value of not rushing through the process to force artwork to be prematurely born showed its outcome beautifully. It was our distinctive point that we prefer to walk through process of art making slowly from the beginning – from gathering experiences, translating onto paper, and transforming all creative marks into artwork – for the little artists to understand and be innately and daringly creative when they were to make art in the future. Most important part we learnt throng this journey was the learning how to appreciate beauty of simple things in everyday life which laid foundation of a positive and creative way of thinking throughout there life. Finally I came back to Singapore working with the same company as last time. After I left the company in December 2015, things have been so complicated. Many changes happened in both good and bad way. I’d been traveling back and forth between Singapore and Thailand almost every three months before this final decision. Why did I decide to come back? It was such a difficult decision to make. As an artist, there is no doubts it was the right decision. However, as a yoga teacher (as how people call me), as one of directors of my family’s businesses in my country, and as a buddhist disciple who (thought she) was ready to follow buddha’s path, this was the most stupid decision one could make. But there are many roles we need to play. Questions rise. How many of them are conflicting with the others. And how legitimate it was to prioritize one over the others? Well, if I put it this way, it may sound more legit for every role I am playing. This company is distinct from other dance companies I know. It does not train me to be a better dancer, but to be a better artist with a well balanced of enough pressure and enough space for creativity. The most important thing that is a tipping point which brought me back here was its outreach programs. Since young, I have felt the urge of making the art I do useful. I had a plan to do MA in dance therapy but until now I haven’t had a chance to pursue that dream. However, one of the main works we do in this company forced me to research more in how to use art, dance, movement, and creativity for therapeutic purpose. We call it ‘elderly program’ and recently, I have been very into it. We are doing research on how can we use dance to engage both physical and mental aspect of elderly people. Our assumption is that dance requires coordination of different body parts which in turn stimulates activities in a brain. And to inspire elderly people to dance, imaginary and creativity which fall under mental aspect come to play an important role. It is the doing the movements with some clear goal in mind that really helps elderly people as a whole person, not only physical body. We try not to just reach hands up and bring them down ten times, but to have a high cloth hanging rod in mind and the wanting to hang our clothes on it with a glimpse of joy from accompanied music and dance making elements that engage both body and mind. Like movements session for elderly, I believe we should live our lives with clear goals in mind and have fun with whatever we are doing. Now I have completed my second month in the same company. To be honest, the latter has not quite been achieved yet. This also due to my worry for my other responsibilities in my home town too. My life as an artist would be easier and more fluid if I could ride on the momentum of work with out having to think about my works in another country. But well, it is family’s businesses and for my yoga studio, I have promised, I’d not quit. Working in two countries sounds too adventurous for me. I am not excited about it. It is tiring. Nevertheless, I think the best thing I can do for now is find the meanings of every work I have to do and really believe in them as they are fuel for me to run this mental engine. I can work, be it art, business, or yoga, as long as I know they are meaningful. As long as I feel my life exists for a purpose. I was on the hill somewhere in India. The song by Deva Premal – Chidananda was in my head and the surrounding was beautiful. And I started to move. I had been a dancer/movement artist for all my life. Things stopped when life force me back to my country. I was lost and couldn’t feel the new ground under my feet. Watching myself dance on the hill help realign my self a bit. After all I still miss dancing with my ex company in Singapore. In other words, I miss my life. But this feeling shall pass. The road doesn’t end. I just made another turn. COMPANY RHS | It is all about energy. It is all about mind. 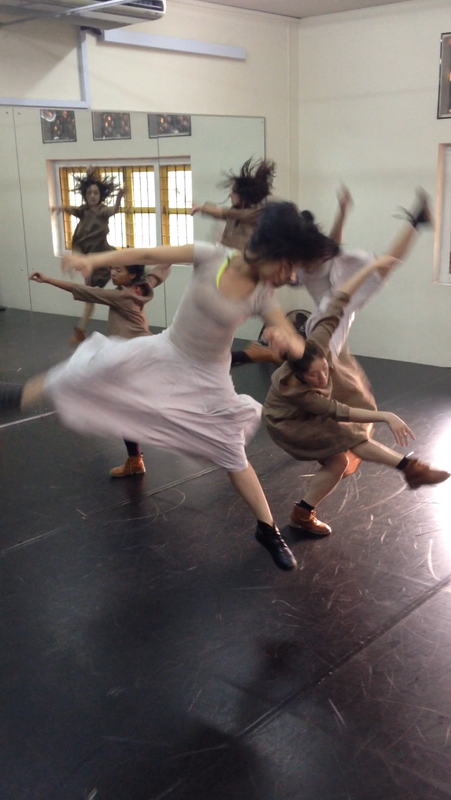 Our contemporary dance company has a training class 4 days a week. One out of four is a body conditioning class. We do a lot of cardio and weight training. Our rehearsal director has a lot of administrative works to do recently, so it is always me who has to lead this class. But not for the class 2 weeks ago. I asked my colleague to lead the class as I felt very tired and (I hate to admit that I also felt) lazy. My colleague is a fantastic dancer with a lot of experiences. She joined the company around the same time as me. Just only because my English is better so my director let me lead the class (and rehearsals, sometimes) more often than her. 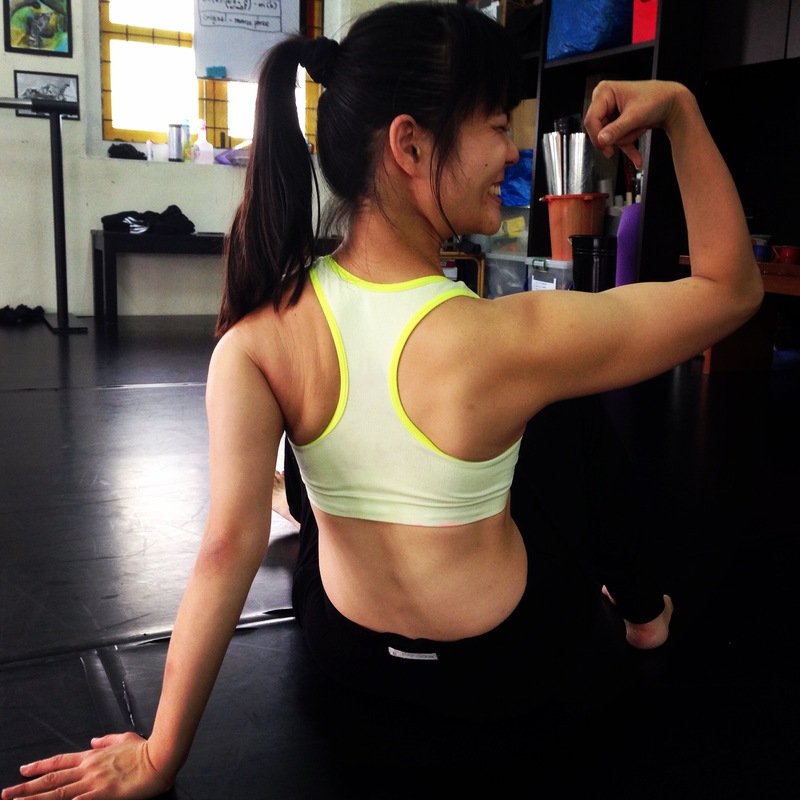 Normally, in the body conditioning class which I led, I always felt her energy was a bit low or because she saved her energy, but not in this particular session. When she led the class, she was full of energy and could do more than what she normally did. What’s more, it was me who was not able to perform as good as how I normally was when I led the class. Every session, I could psych myself up before we started push-ups which I counted loudly for everyone, and I ended up with more energy at the end of the class than when we started. But for this session, that energy kept going down and down. I asked my colleague after the class how she felt. Not surprising, she said she felt she had more energy than usual. What I learned from that day was that working out has a lot to do with mind. It’s a mental work as well as a physical work. When you know you are leading, you prepare your mind so you have enough energy for yourself and everyone under your leading. You call for 32 push-ups and hold in a plank position for 64 counts and you know that you can’t fail. The only choice you have is to complete it. You’ve prepared your mind. So it is about mind. The mind has an absolute control over energy. If you don’t control your mind, it will control you (quoted from my Indian yoga teacher). It is the mind telling you that you can or cannot do. If you do it, you have to have already known that you CAN because it is the only way to succeed in that particular task. You don’t have to be a leader. You just really need to tell yourself that to complete the task is the only one choice you have. It’s good to be crazy. Craziness lifts energy up high. Today our company worked about covering and uncovering. We just used scarf, jacket to cover a friend and a friend uncovered herself. Then took turn. Me : Being covered = I felt safe. Cover come one = I felt love. My partner : Being covered = She felt struggling. Covering me = She felt sorry for me. So funny as we danced together. Same movement, but completely different feeling. One Japanese dancer performed a movement of covering someone like making a nice packaging of something. That made me think of how Japanese people like to wrap the products nicely, sometimes overly too nice. She shared with us that Japanese wrapping things nicely was because they wanted the receivers to feel good. I had a feeling that it was the same as Japanese people themselves. Sometimes they wrap themselves very nicely with a lot of rules in their cultures cause they want other people to feel good. There’s nothing good or bad about this. It is just my observation. The rehearsal was fun though. The ‘OTHER’ Me project | Do you think you know .. your ‘other you’? I’m still exploring on the same project. I hope I won’t turn mad. Haha it’s fun. Now my macbook is about to explode. I have been storing too many videos. Though I try to keep my archives in 4shared.com, I think I still need an external hard disk. Brrrr… dealing with computer thingy is the most frustrating task in the world. One of the fresh graduated dancer in a company I am working with now is having trouble. 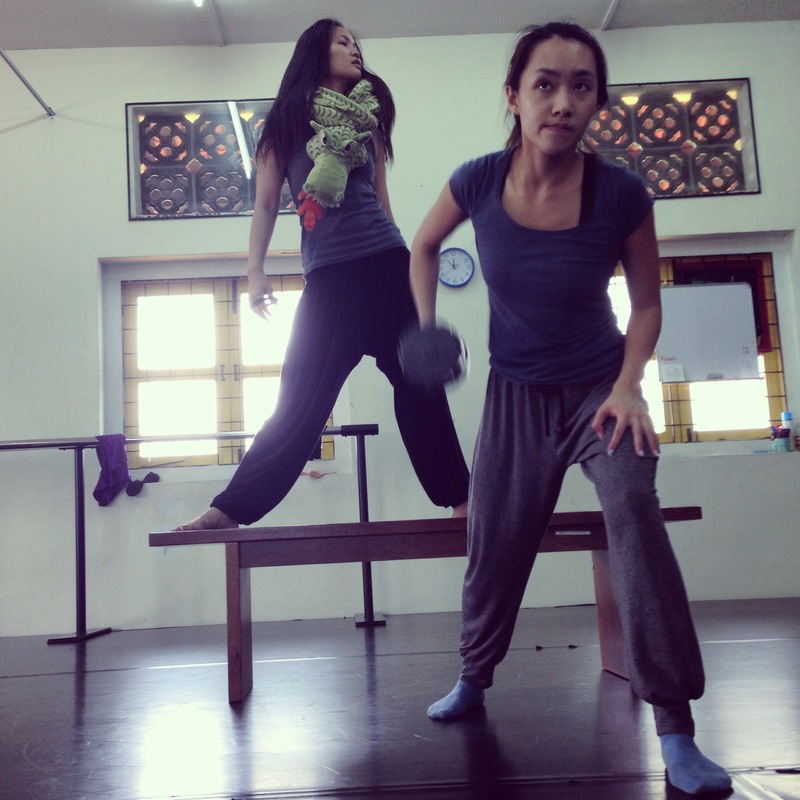 Being a dance student is much different from being a professional dancer in a company. 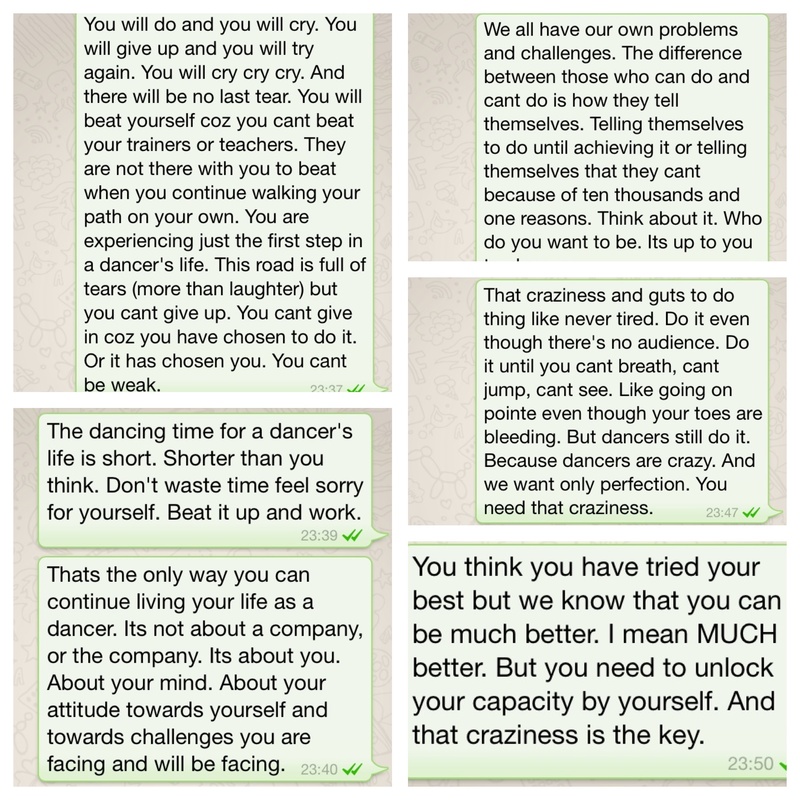 This is true not only in a dance career. In a school, you pay for people to look at you and teach you. In a company, you are paid for doing a good job and learning by yourself as fast as possible. She doesn’t understand this. She has a student attitude and we have given her almost a year already. In an appraisal she still had a lot of invalid excuses. My director decided to give her one last chance until end of the year for her to climb up to the professional level of mind. However, at the end of the day she asked the director whether she could dyer her hair in red color. Absolutely wrong timing. Not surprising that the director was upset even more but she let her do whatever she wanted. ‘Sometimes doing ones best isn’t enough to keep you going, not anymore’. I could tell that she didn’t understand what I tried to say. She didn’t say anything after that. I wondered she went to cry or blame someone else about her problem or blame herself for choosing me to talk with. I didn’t care. I went to bed after that not waiting for her reply. We came back to the studio 2 days later. She was there already getting ready for the class and rehearsal. She talked less and worked hard. I was happy to see that. In this way, although she can’t pass this last probation, all the works she is working on will make her a better dancer, the best she can be. People need to be slapped on the face sometimes. I call it a wake up call.